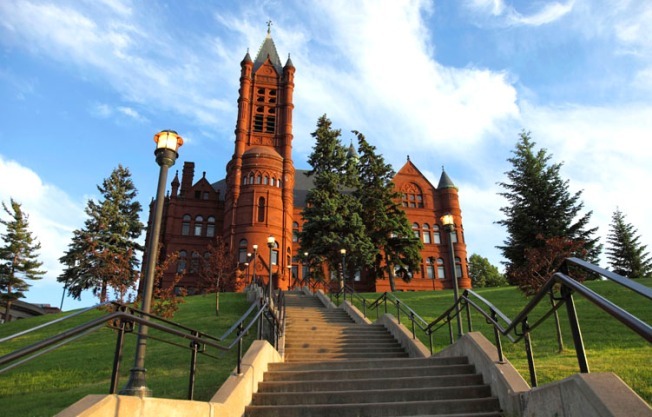 Protesters at Syracuse University have demanded that the school release video showing racist and sexist behavior by members of a now-suspended fraternity. The school's chancellor, Ken Syverud, described the video involving members of Theta Tau, a professional engineering fraternity, as racist, anti-Semitic, homophobic, sexist and hostile to people with disabilities. He said the videos, which were posted to a private Facebook group, were turned over to the school's Department of Public Safety for possible disciplinary or legal action. The Daily Orange, the school's independently run newspaper, obtained a copy of a six-minute video from an initiation ceremony and shared it online, NBC News reported. It was not clear when the video was taken and has not been verified by NBC News. "I am appalled by this and deeply concerned for all members of our community," Chancellor Kent Syverud wrote in an email, according to The Post-Standard. Theta Tau is investigating and said the behaviors described were not representative of its "very diverse organization." The fraternity's Austin-based headquarters did not immediately respond to NBC News' request for comment. On Tuesday, California Polytechnic State University suspended all fraternities and sororities after photos surfaced showing fraternity members in blackface. Syracuse University held a gathering Wednesday to promote "community dialogue." Later, about 100 people marched through the campus carrying signs and chanting. Then, 400 attended a three-hour discussion, venting frustrations over what they view as systemic racism and sexism at the school. Students at the discussion recommended leading by example, making certain African-American Studies courses mandatory and finding a better way to organize. "This gives me a reason to stay here until they fix things," junior Saumya Melwani said. Theta Tau later said in a statement that every single member "would like to apologize to everyone affected by the racist video that was recorded as a part of our new member process."